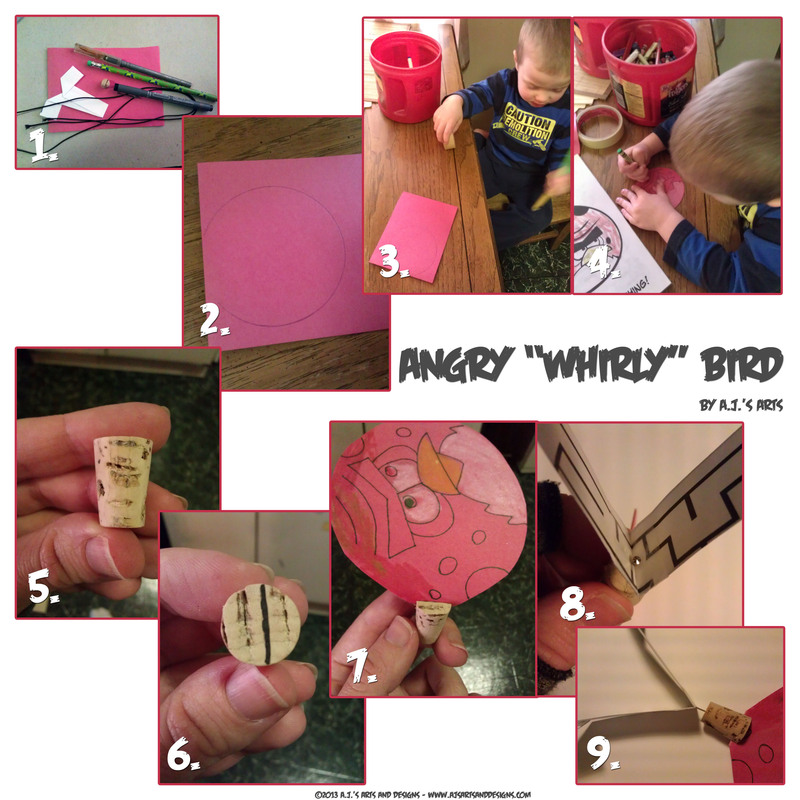 Angry “Whirly” Bird | Who Are You Calling Crafty? My children like most children are a tad obsessed with Angry Birds, Booga especially if he could have an Angry Bird drive a Train it would be the greatest thing ever. I have been really trying to do more projects with Booga but he has the attention of a 3 year old boy (imagine that) which means the projects have to be EASY and FAST! This project has an extra bonus of being made to swing around, which he loves making the bird fly. 2. Draw circle on the folded edge. 4. Allow your helper to color the bird (as you can see I drew my bird from the coloring book). 6. Draw and cut a line on the top of the cork. 7. Slide the paper into the slit in the cork. 8. Add the pin to the center of the paper strip. 9. Insert the pin into the cork. 10. Attached string, yarn or ribbon to the bird and to the pencil and swing it around.